Glenballyeamon is also called Edwardstown glen, and Cushendall lies at its foot. If you go down to the sea at Cushendall and follow the cliff path, northwards from the village, you will come to a very special place. 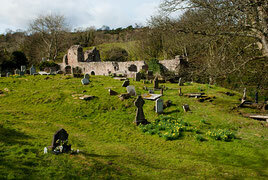 It is the site of the ruins of Layd Church, which dates from around 1300. It is a place of great peacefulness and remoteness. A small stream runs along the side of the church, the sound of which, together with birdsong, is the only music you will hear there now.